Later this year Mr Boo and I will be celebrating our 10th wedding anniversary, the same date marks the 14 years in which the two of us and became a couple. Meeting at just 17 years old there are many who would have never have thought in a million years that we would still be together now. To Mr Boo and I however we believe that we have all the time in the world together, from days of drunken nights out, to cosy nights in, wedding preparations, starting a family and completing our family we have stood the test of time. So as you can imagine I want to try to get Mr Boo something special for our ten-year anniversary, something that is both practical but still have that air of specialness about it. For the past few months I have drawn a blank until a seemingly ordinary conversation between Mr Boo and I this morning got me thinking. In all the years I have known Mr Boo there is one thing he has to have on him every single day… his watch. Whether we are just chilling around the house, he is off to work or even when we are on holiday. Mr Boo hates nothing more than not knowing what the time is, so having a reliable, solid watch is very important to him. So this afternoon I have been trawling the internet for a fabulous watch to show him how much I love him and that I hope we still have all the time in the world together. Stumbling across The Watch Hut (aptly named) I have to admit to being a little overwhelmed by the selection of watches from all different designers, in all different price bands. 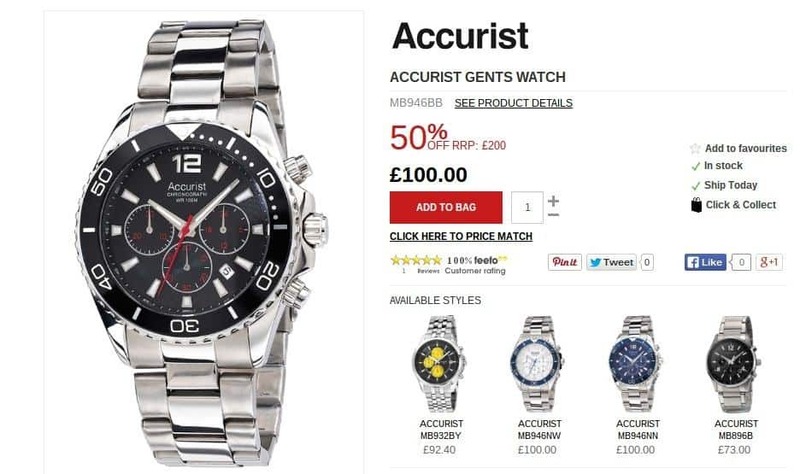 I think I have managed to find the perfect watch, an Accurist chronograph watch that has a RRP of £200 but currently on sale at half price. The stainless steel wristband and water resistant dial make it hard wearing throughout what both family life and work will throw at it. Hopefully whenever he looks at it he will think of our life together and realise that we have all the time in the world. I’ve made a note of the Watch Hut as Papasaurus goes through watches like there’s no tomorrow! My husband reckons you can tell a lot about a man by his watch, and he doesnt trust men that don’t wear watches. I think this one looks gorgeous. And at that price it is a bargain. And what a lovely way to mark your anniversary. Mr A collects them which means I always have a present idea for him. One Christmas he got a display case for them as a pressie. Love the engraving idea too! What a gorgeous post! Happy anniversary to you both when it comes. Gorgeous watch – maybe I should get my OH one – maybe he won’t always be late then! This sounds familiar! We have been married 10 years this year too and will have been together 14 years a few days before our anniversary! I haven’t even thought about gifts yet! Many Congratulations on your anniversary. Wishing you many more years of togetherness. The watch sounds like a perfect gift. I think this is the perfect idea for an anniversary present. What lovely words too. Good luck with the competition. I love that you got married on your dating anniversary – I did that too, that way I knew my hubby would never forget. Good Luck! Ahhh, lovely post. A very thoughtful gift. Have a lovely wedding anniversary! A brilliant present for a big anniversary! Love Donna’s idea about engraving it too!